MORE TIME? : Rep. Peter Conlon, D-Cornwall, discusses an amendment to extend the deadline for Act 46 school district mergers for certain communities. His proposal, introduced briefly Wednesday on the House floor, will be debated on Thursday. 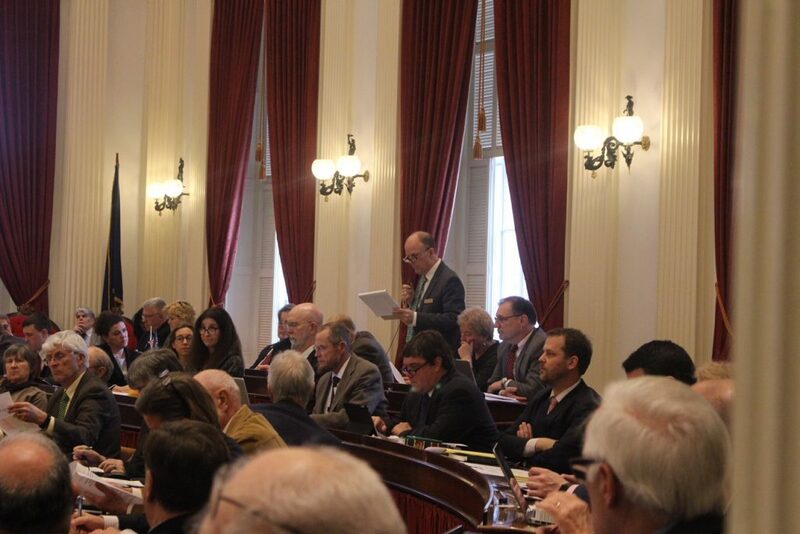 MONTPELIER — The Vermont House of Representatives on Wednesday voted down a proposed amendment that would have allowed a one-year extension for forced school district mergers under Act 46. The vote, which did not fall along party lines, was 74-69 against the extension. Two weeks ago, a tripartisan group of lawmakers led by Rep. Heidi Scheuermann, R-Stowe, announced a plan to delay mergers to give the courts time to rule on the constitutionality of Act 46. Towns that have been unable to merge are worried that if they proceed too far in the consolidation process, reverting back to their original governance structure will be too complicated or costly should the courts strike down the law. H.39, better known as the “Scheuermann Amendment,” would have reset the deadline to July 1, 2020, for any school board that subsequently votes to put their proposed merger on hold. Scheuermann, speaking to fellow representatives ahead of Wednesday’s roll call vote, explained what her proposal would and wouldn’t do. “This amendment does nothing to negate Act 46 and to stop mergers. What it does do, though, is provide us additional time,” she said. Scheuermann added that mergers have simply proved too complicated for many towns. With that amendment defeated, the House on Thursday will consider a different amendment that proposes another approach to helping stalled communities move forward. That plan, called the “Conlon-Cupoli-Webb Amendment,” passed the House Education Committee late Tuesday afternoon. It has the state choosing which districts have to merge this year and which schools get another year. It has seven mergers scheduled for 2019 and six mergers scheduled for 2020, according to the language of the proposal. Under this plan, communities that didn’t vote on a school merger plan would get a one-year extension, until July 1, 2020. Rep. Peter Conlon, D-Cornwall, ranking member of the House Education Committee, said many citizen volunteers have been working tirelessly on mergers and should not have to have their progress impeded. “To now tell them that one of your communities would like to delay here by at least a year would turn their process back,” he said. Conlon further emphasized that when Act 46 was passed, the July 1, 2019, deadline for functional mergers was the target. The Vermont Legislature passed the sweeping education governance law in 2015 in hopes of merging more than 270 smaller districts down to fewer than a hundred larger districts. The law provided tax breaks to communities that opted to merge voluntarily. In November 2018, the State Board of Education ruled that dozens of stalled districts must merge by July 1, 2019. In response, at least 20 school boards joined lawsuits opposing the mergers. The effort is being led by the Alliance of Vermont School Board Members. One grouping of districts that finds itself in a bind is the new Orleans Southwest Union Elementary School District, which consists of Hardwick, Greensboro, Woodbury and Stannard. All four communities were told by the former secretary of education that they did not need to merge because their school governance structures were too dissimilar. Late last year, however, the State Board of Education reversed course and called for a merger. The debate on Wednesday was heated at times, and split Vermont’s three major parties in unpredictable ways. Rep. Brian Cina, a Progressive lawmaker from Burlington who voted for the Scheuermann amendment, reminded House members to keep in mind the people most impacted by their vote. “I need to know how the consequences of each choice will affect the children,” he said. The results of Wednesday’s roll call vote can be viewed online here.